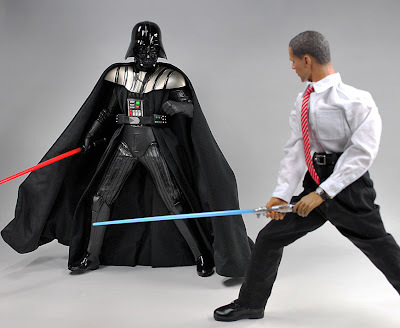 Ananka's Diary: Obama Action Figures! No matter how you feel about our new president, you gotta admit that these Japanese action figures are pretty darn awesome. (Darth Vader doesn't stand a chance!) Unfortunately, the site that sells them appears to be down. I'll link when I can! Those are just kind of silly if you ask me. Action figures modeled after real people are weird. It doesn't look like that but i bought an Obama action figure at Books a Million for my mom's Channukah present. Another Japan-Obama comment. Obama's inauguration was celebrated by a small Japanese town called........ Obama. Apparently the party was Hawaii-themed. if obama's presidency rocks as much as that did, our country will fly. I'm amused. I hope he gets some and keeps them on his desk in the oval office. On the other hand I hope the people in this country don't get their hopes too far up, I mean, Mr. Obama seems like a cool guy but he's only human so he can't fix everything all at once! Please watch that video^^ of a Darth Vader prank call! It is hilarious! That's so wild. It reminds me of a guy in my youth group who thinks that instead of the election, we should have each party pick their candidate and then put them all in a padded room and have them duke it out...whoever's alive after an hour wins the presidency. And yes! Happy Chinese New Year! A week or so ago, I was in the grocery store with my mother, and I heard a woman say, "Look! Obama action figures!" and her son said, "Oh. Just what I've always wanted." (Sarcastically.) Hihihi! And also, happy year of the Ox! go kiki strike! i just finished shadow city (awesome)!!! Anyway, Obama actoin figures r funny! 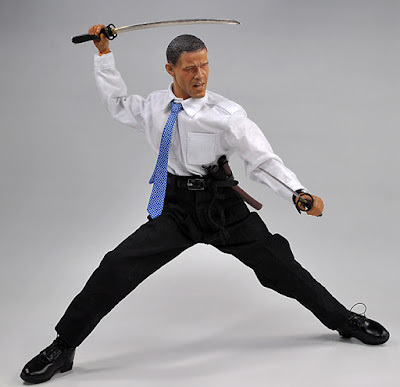 Why are the Japanese making action figures for our President? Haha, that's so awesome. I want one. AWESOME!!!! Obama is amazing (in my humble opinion). Funny. Darth Vader dosnt stand a chance.